For reasons that I won’t get in to, I had to change the default HTTP port on my Linksys DCS-5300G wireless web camera. The camera has wireless networking built in so, if you can provide it power and keep it in reach of a wireless hub, you can set it anywhere you want. For example, I’ve been known to mount it out on my patio at the end of a chain of outdoor lights (aka Christmas lights). The last bit of the light chain has a power plug, ostensibly to connect the next chain of lights. Or to power a web camera. The web camera is managed via a built-in web server. 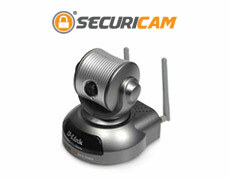 All you do is point your web browser to the IP address of the camera, log in, and make any changes you want. Well, almost any change. For no explicable reason, I cannot change the networking settings on the camera. The submit button flat doesn’t work. I tried IE8 beta on Vista x64. Fail. I tried Google Chrome on Vista x64. Fail. I tried IE6 on Windows Server 2003. Fail. I tried Firefox 3.0.1 on Windows Server 2003. Fail. I tried IE6 on Windows XP. Fail. So I started to hack about a bit. I telnetted to the device and logged in. But all it told me was the cryptic message “Authorized and start service”. At that point, the telnet session pretty much refused to respond to anything. I next decided to see if I could FTP to the device. That worked and performing an “ls” showed me the available files on the webcam. The config.ini file seemed like a good one so I did a “get config.ini” and looked at it on my PC via Notepad. This was the mother-lode. There doesn’t appear to be anything in this file that is not accessible via the GUI so I don’t see much you can hack. I was able to find the section which stored the IP address and HTTP Port information that I could not edit via the GUI. So I edited it via notepad and did an FTP Put to ship the file back to the webcam. After rebooting the webcam, the changes I put into the config.ini file stuck. So hooray me! Interestingly, the FTP Daemon on the webcam does not support the delete or rename verbs. The only way to change the file is to copy over the original. So make a backup copy of the original config.ini on your PC should you screw something up. In the worst case you can do a factory reset on the webcam. What was your login/pwd used to ftp? Hacks, please that’s just configuration. You can install the vivotek PT31x1 firmware on this camera by copying the .bin down through FTP. Then reboot it, install the Vivotek IW2 software on your pc and push the PT31x1 firmware upgrade to the camera again using IW2. After rebooting once more, you’ll be using a Vivotek PT31x1. it has you believing it’s a Linksys, when it’s really a D-Link! !